Jack M. Balkin, Knight Professor of Constitutional Law and the First Amendment at Yale Law School. The Spring 2018 Mitchell Lecture addresses free speech and capitalism. With those challenging words, this spring’s Mitchell Lecture speaker defined the economic trade-off made by everyone who uses the web: enjoying unlimited access to information, but at the price of giving up voluminous personal data. The speaker was Jack M. Balkin, Knight Professor of Constitutional Law and the First Amendment at Yale Law School. His April 13 appearance at UB School of Law, titled “The First Amendment in the Second Gilded Age,” explored the question of how, in a capitalist society, we pay for exercising our freedom of speech. Drawing a comparison with the Gilded Age – the late 19th century era of rapid economic growth that made a handful of industrialists and financiers unimaginably wealthy – Balkin argued that we’re in a second Gilded Age. Instead of oil and banking, though, he said, the most valuable commodity today is information. In the last century, he noted, information flowed “from the few to the many,” promulgated by newspapers, broadcasters and book publishers. Now, every one of us is a content generator. At issue is the economics of this new information economy: Who pays for the platforms that support public discussion? Newspapers can sell subscriptions and advertising space; broadcasters can sell air time. The business model of social media companies and search engines like Google, he noted, relies on advertising as well – namely the ability to target ads to individual consumers based on highly specific data these services gather. “What is the result of an infrastructure of free expression that is primarily based on the exchange of free services for advertising?” he asked. “The answer can be summed up in one word: surveillance. Everything you do online leaves a trace. This medium is simultaneously a method of communication and a method of surveillance.” That’s increasingly true, Balkin said, with the advent of the Internet of Things, a time when even cars, ovens and refrigerators are being designed to collect data on their owners’ habits. That bargain introduces the problem of how to ensure that all this collected data is used responsibly. “We have to find a way to prevent these search engine and social media companies from misusing and abusing their position as the collectors of personal data,” Balkin said. His proposed solution: to treat these companies as “information fiduciaries,” bound by the same rules that say lawyers, doctors and accountants cannot use information they gain to hurt or cheat their clients. In looking at applying this concept to the public sphere, he said, “Currently the law does not recognize this concept. But all of the elements of this idea are present in law. 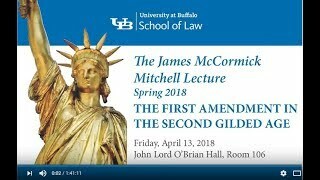 The Mitchell Lecture Series, the School of Law’s only endowed lecture, has brought a distinguished list of scholars and thinkers to Buffalo each year since 1951. This year’s organizing committee, chaired by Professor Luis E. Chiesa, included Professor Mateo Taussig-Rubo, Assistant Clinical Professor Nicole Hallett, Manager of Law School Technology Terrence McCormack and Director of Student Life Amy Atkinson.